Esquire releases are famed for their “paving-slab” thickness, in sharp contrast to the dwidling substance of their US counterparts, and the hazard of recycled vinyl incorporated into some pressings for Prestige towards the mid Sixties. To add some science to the impression, all of my sixty-odd Esquires stepped on to the scales. Technically not a normal distribution, but with one shoulder skewed towards the heavier side, with an average weight of 181 grams, the heaviest a whopping 247 grams, and one in five weighing over 200 grams. This would appears a fair amount heavier than was normal for Decca, who I believe pressed Esquire, judging by the use of Vogue-style inner sleeves and references to Decca in Peter Newbrook’s bio in the British Library. This may possibly have beeen a side-effect of the use of US-supplied stampers, which one can imagine gave Decca engineers a headache and which for some reason might have created greater clearance in press than their own stamper technology, using up more vinyl. 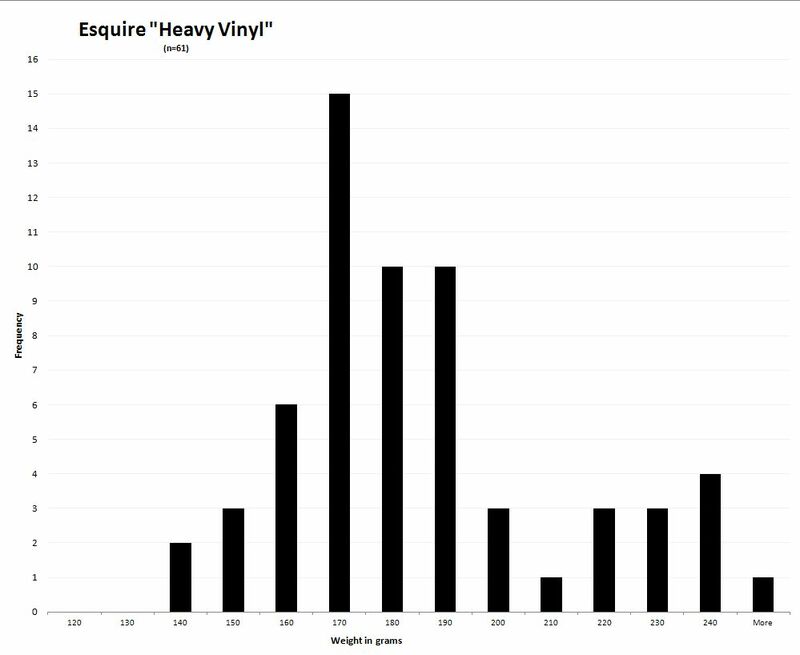 To repeat what has been written elsewhere, the weight and thickness of vinyl has no bearing on the sound – the depth of cut was set during mastering, and would result in the same “image” whether pressed on thick or thin vinyl. However it would not be surprising if Decca engineers made allowance for a deeper cut on the US stampers..
One thing I do know – the heavier vinyl the more resilient it is in the face of surface scuffs and scratches and fifty years wear and tear, the thinner the vinyl, thevulnerable the surface to defect. I had occasion once to accidentally scuff a wafer-thin 115g Verve. Applying the age-old test “if you can feel it, you will hear it” I was greatly relieved the scratch was not in any way “feelable”. Unfortunately left an audible “tic” the width of the side. Esquires are records you can clog-dance on..